VulgarGrad bring you the old songs of the Russian thieves (blatnie pesny or blatnyak), along with punk classics of the Perestroika era. Throughout the twentieth century, criminal culture always played a strong, if unofficial part in Russian cultural life, and this was never more highly developed than in the thieves’ songs, or blatnye pesni – performed by, for, and about criminals in the prisons, gulags and seedy bars of Soviet and post-Soviet Russia. Famous exponents of the genre include Leonid Utesov (although Jewish, actually one of Stalin’s favourite singers) in the 1920s and 30s, Arkady Severny and the great Vladimir Vysotsky in the 60s and 70s, while more recently, groups such as Leningrad and La-Minor have incorporated the blatnyak style and lyrical content into their sound. 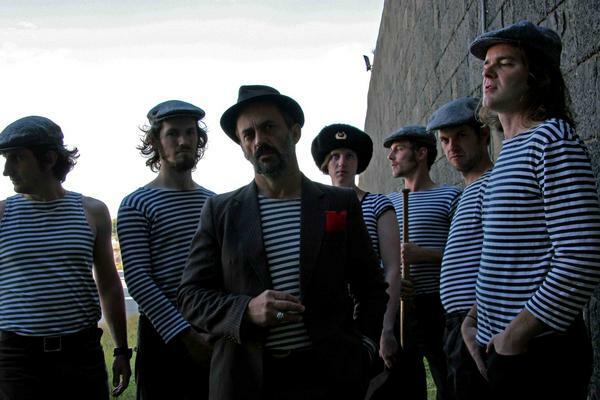 VulgarGrad combine elements from all of these performers, updating it into their own inimitable sound, producing something that transcends the language barrier by aiming straight for your convict heritage and your dancing feet. Since that time they have caused a sensation on Australia’s live music and festival scene, proving that what Australian audiences really seem to need is a wild night of old-fashioned Russian criminality. After all, if Russia and Australia have anything in common, it’s convicts. VulgarGrad have performed at leading venues and festivals around Australia, including The Famous Spiegeltent, The Toff in Town, the Melbourne International Arts Festival, St. Kilda Festival, The Adelaide Fringe Festival (SA), The Woodford Folk Festival, the Brisbane Cabaret Festival (Qld), The Northbridge Festival (WA), The Sydney Opera House Studio, The Sydney Festival, and the Great Escape Festival (NSW). VulgarGrad were featured in the soundtrack for the Channel 9 drama series, Underbelly in 2008. They also guested on ABC TV’s Spicks and Specks in August 2008.